PN junction diode works very well in the forward bias and pass current through it. If you want to operate this PN junction diode in reverse Bias,we need to apply a voltage greater than the breakdown voltage at which the reverse Bias depletion layer can be dominated. Theoretically it looks fine but practically any PN junction diode cannot withstand that much of the high-voltage. Even before it practically reaches the breakdown potential,it will damage itself therefore we cannot use the PN junction diode in reverse Bias. For the purpose of using the diode in reverse Bias,special diode is designed and its name is zeenar are diode. This is a highly doped PN junction diode. Its properties are similar to the PN junction diode in forward bias. 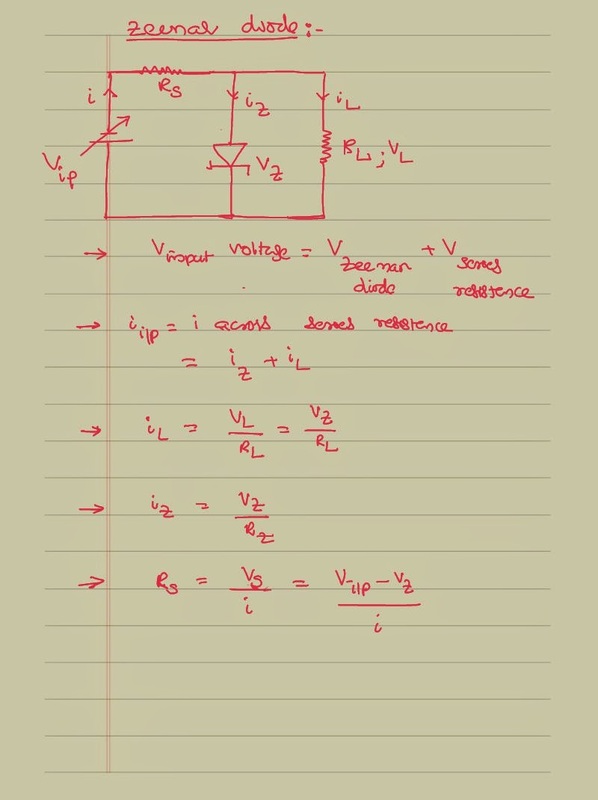 But in reverse Bias its breakdown voltage is a low value, therefore it can pass current even in the reverse bias without breaking the device itself. Therefore we can use this PN junction diode in reverse Bias without damaging it. In reverse Bias once if you apply the voltage equal to breakdown voltage,the Zeenar diode start passing current.Here all charges got enough energy to cross the potential barrier.Hence we need not apply any further voltage.Thus in the breakdown region, the voltage remains constant and current will be keep on increasing since all the charges has got enough energy to cross from one side to another side of the depletion region. Taking this property is an advantage this zenar diode can be used to like a voltage regulator. It is obvious that we can use this kind of the diode in reverse Bias and we prefer to use it only when it is required to be connected in reverse Bias. It is simply because if you want to connect it in the forward bias, we already had PN junction diode which is a much cheaper and easier option. A zenar diode is connected in reverse Bias as shown. The output is connected to a load resistance in parallel. Being the diode and the load resistance in parallel they always have the same voltage and current among them a share is inversely proportional to their resistance. When the input voltage is less than the breakdown voltage, circuit will never start passing current. When the applied voltage is more than the zenar breakdown voltage, there is an extra voltage available in the circuit.This extra voltage can create unnecessary heat in the circuit. To control is kind of the extra heat due to extra voltage available, we are going to connect a series resistance in the circuit. The very purpose of this resistance is to hold the extra voltage that is available in the circuit therefore the system will be working perfectly. The value of the series resistance can be decided basing on the maximum possible input voltage that we are going to give and the corresponding current that is going to be generated in the circuit. We can identify the corresponding numerical values like current passing in the load resistance, zenar diode, series resistance as shown in the following diagram. Here we shall consider solving a problem in understanding the concept of the Zeenar diode more clearly. Consider the following electronic circuit. Find the current passing to the load resistance as well as the zeenar diode in the circuit. 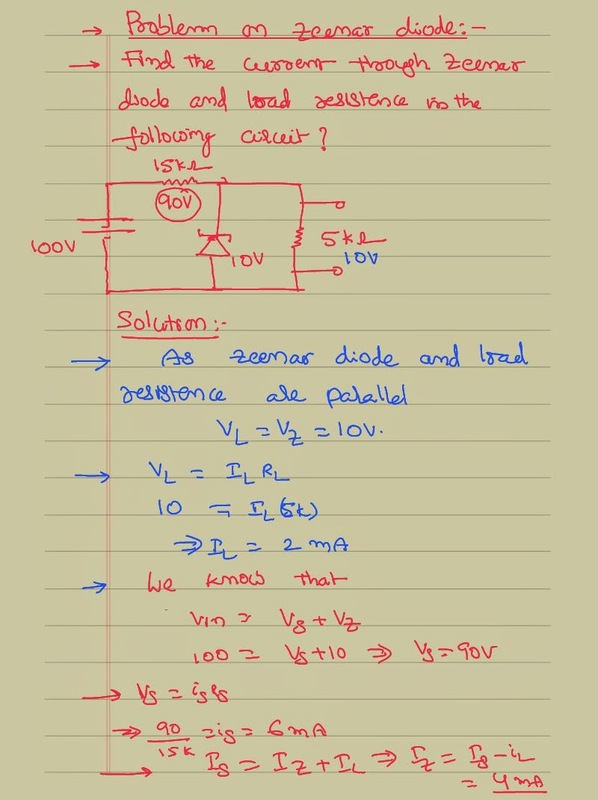 While solving this problem we are actually analyzing almost all the concepts of the zeenar diode. We have to understand that the diode and the load resistance are in parallel to each other and hence they carry the same voltage across them. This is the basic concept that any of the two electric elements who are in parallel to each other will always carry the same voltage and the current between them a shared. We also have to understand that only a portion of the voltage will pass to the diode and all the remaining voltage that we have is passed across the input the series resistance. We also have to understand that the total voltage is going to the passed through the series resistance and it is going to be shared in between the load resistance and the diode in the inverse ratio of their resistances.